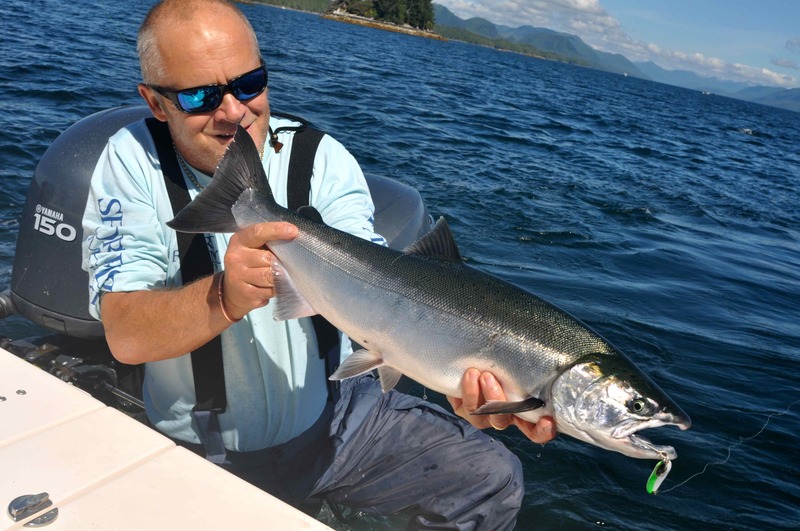 The rich coastal waters off the the coast off British Columbia, Canada’s most westerly province, have long been high on my personal bucket list of destinations to fish. 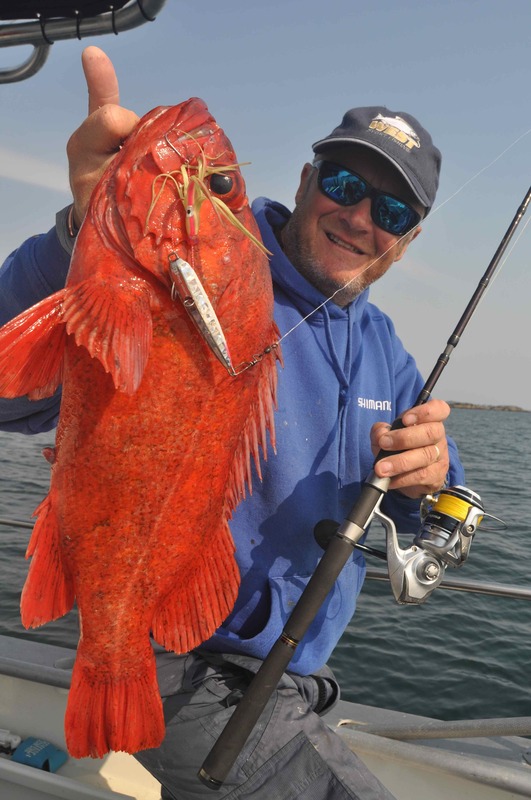 The seemingly limitless opportunities here to catch the various species of Pacific salmon, huge halibut, the fearsome lingcod and the plethora of different types of rock fish that inhabit every patch of reef seemed too good to miss. 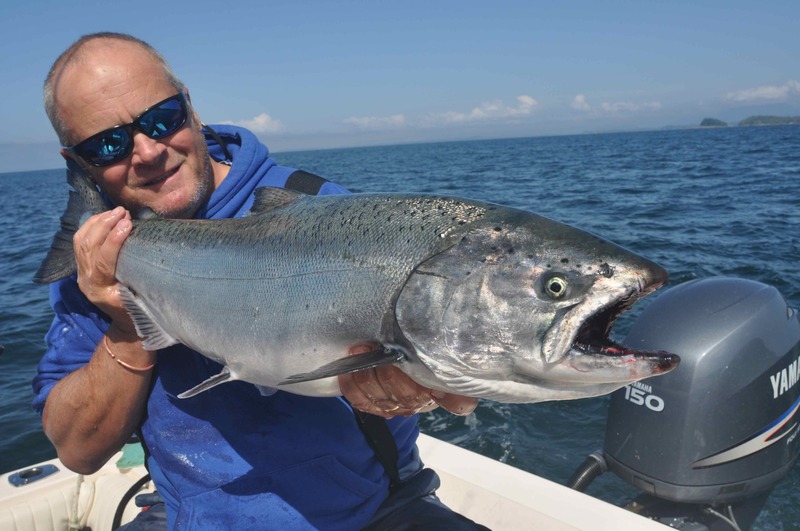 I finally got to realise my dream this August, thanks to an offer to join Doug Olander, editor of American based Sport Fishing Magazine http://www.sportfishingmag.com on a trip to fish out of two lodges north of Vancouver. Sadly my high hopes and anticipation prior to the trip were not met: actually they were exceeded by a somewhat considerable margin. Why sadly? Well as my wife Alison will quickly confirm, already next years diary is almost full to bursting point with dates set aside for various trips. 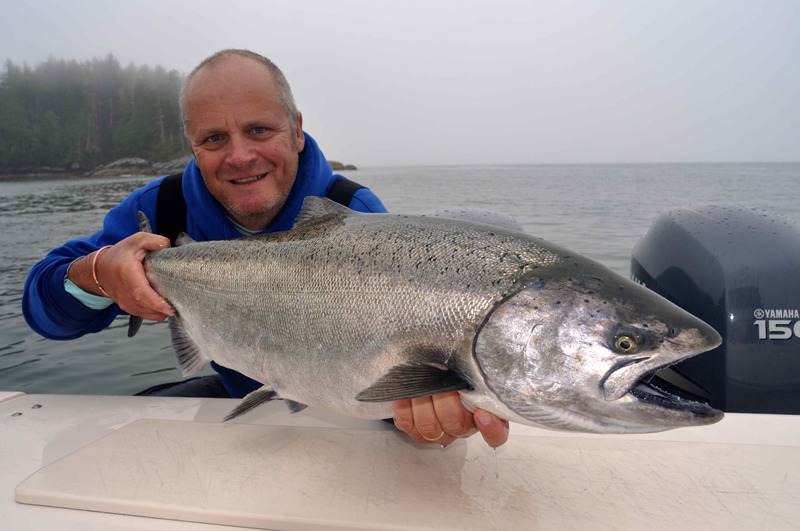 Now I am faced with the problem of somehow squeezing in yet another week of fishing at an already congested time of year; yes I intend going back to British Columbia at the very first opportunity! My trip started with a direct 9 hour flight to Vancouver with Air Canada, followed by an overnight stay at the conveniently located and truly sumptuous Fairmont Vancouver Airport Hotel http://www.fairmont.com/vancouver-airport-richmond/ The following morning we took the airport shuttle bus for the ten minute hop to the airports south terminal, where we caught our Pacific Coastal Airlines flight for the 350 mile flight north to Bella Bella. Here we were met by Trevor Gustafson, who quickly transported us to our first base, Whiskey Cove Lodge, from where we would fish with Trevor’s family run sport fishing operation; Central Coastal Adventures http://centralcoastadventures.ca/index.php An hour or so later we went fishing, and within minutes of starting to slowly troll our lures I was enjoying a lively fight from my first coho salmon. 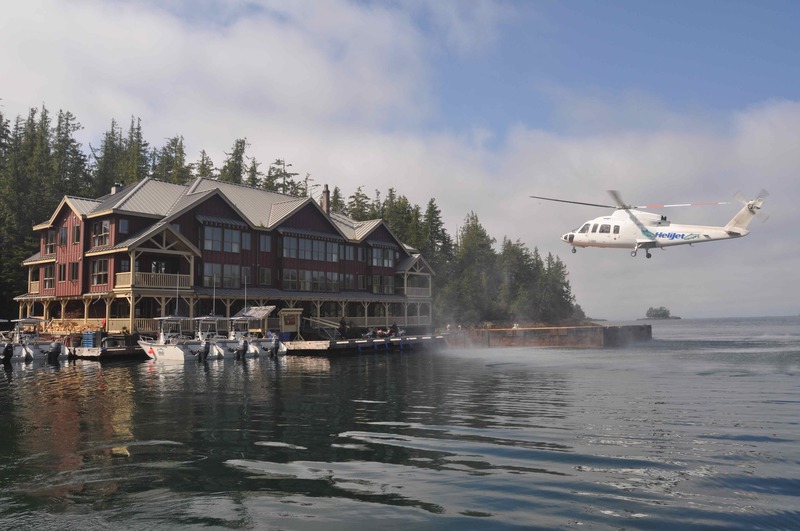 http://www.westsportfishing.com An impressive operation, to say the least, where guests are flown back and forth from Bella Bella airport by helicopter, King Pacific can only be described as a 5* lodge offering superb accommodations and gourmet food. 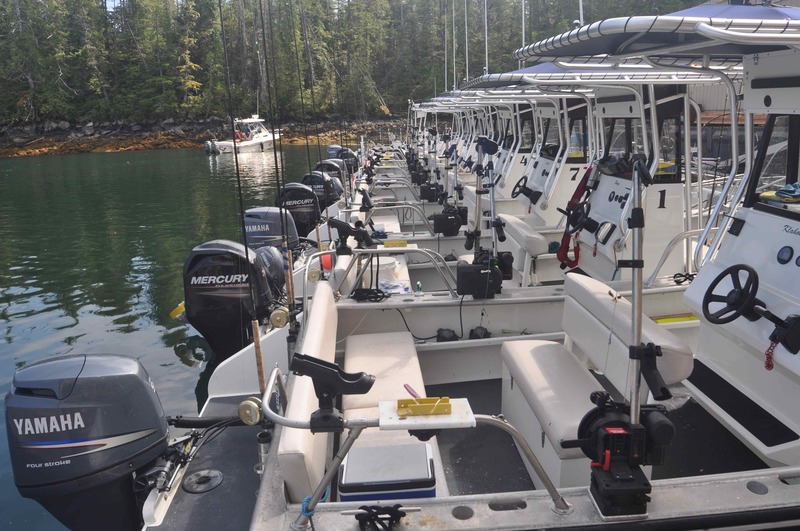 West Sport Fishing run a a huge fleet of extremely well equipped sport fishing boats, there is no need to take any fishing tackle, with guests having the option of either fishing with a guide or, as we did, fishing self-guided. 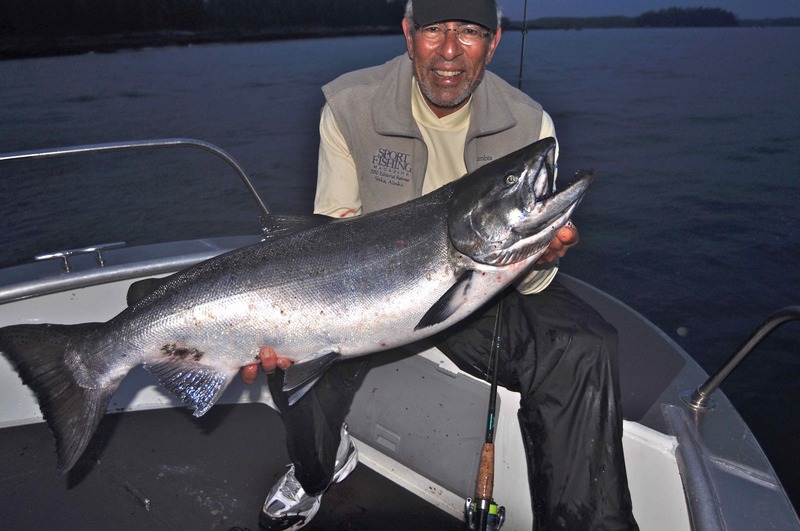 Cheney Point is the salmon hotspot in the area, and its located a mere five minute run from the lodge, perfect for getting out to fish at first light, which is absolute prime time for the biggest chinook salmon that invariably are caught fishing within yards of the kelp strewn rocks. 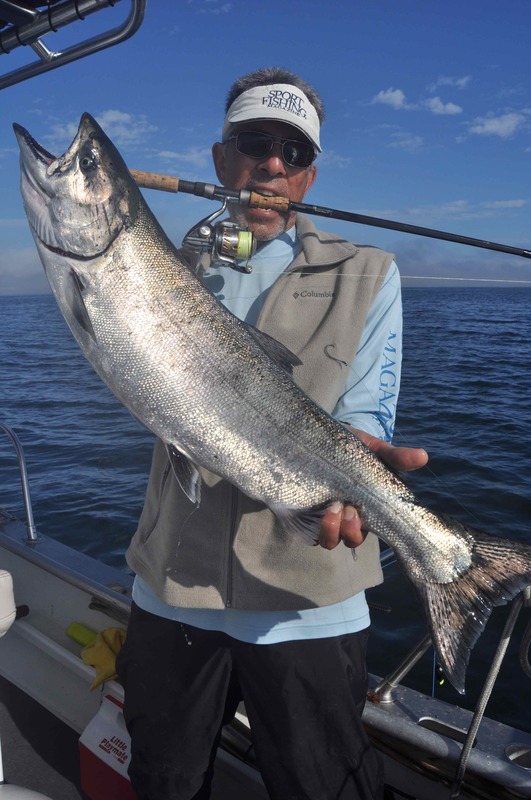 Doug proved the first light point perfectly by taking our biggest salmon of the trip, a stunning 30lb 8oz fish that inhaled a plug cut herring within moments of setting it on the down rigger to fish. 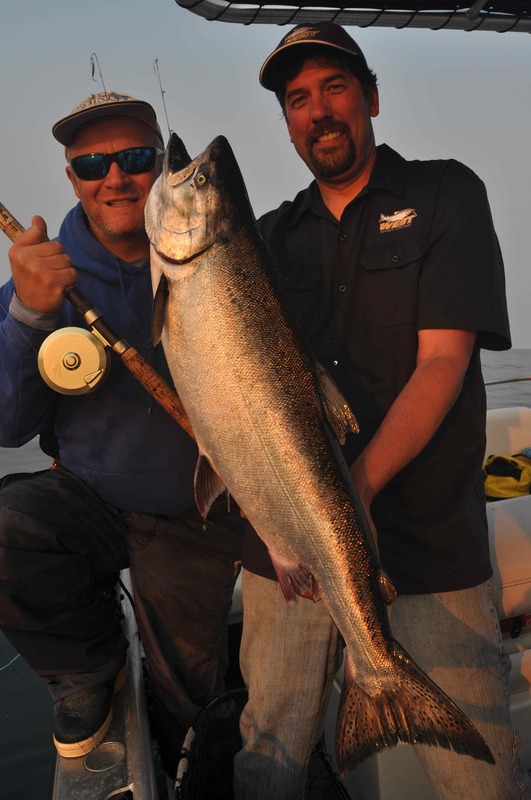 That fish was just one of dozens of salmon, both coho and chinook, we caught during our three day stay. 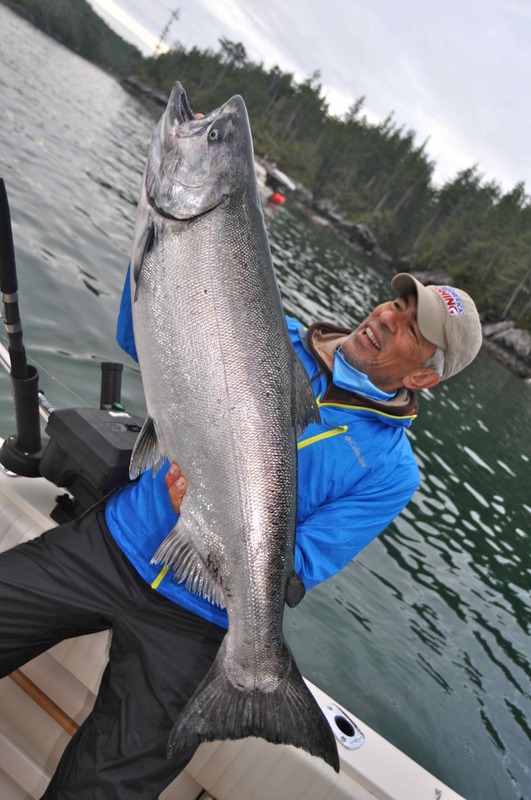 I thought I was in salmon fishing heaven, but everyone told me that the fishing of late had been ‘kind of slow’, which begs the question, just how good is it when the fishing is really good? 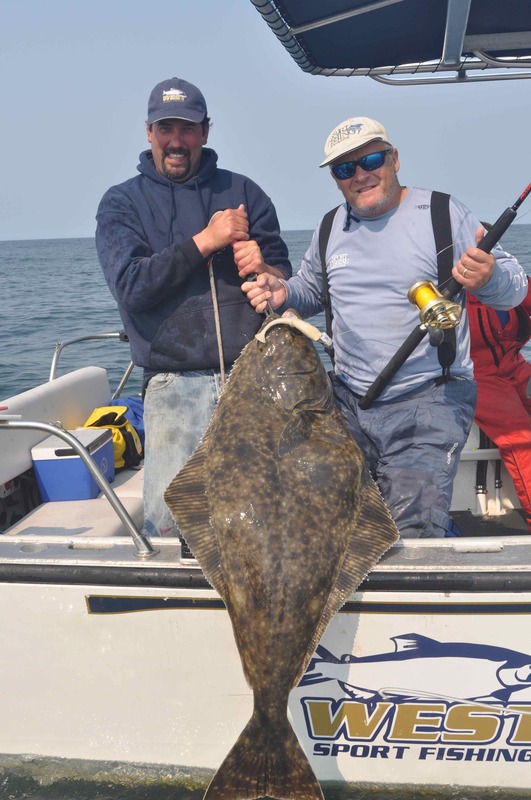 Aside from salmon we spent some time offshore fishing for halibut, and once again found catching them was little more than a formality. 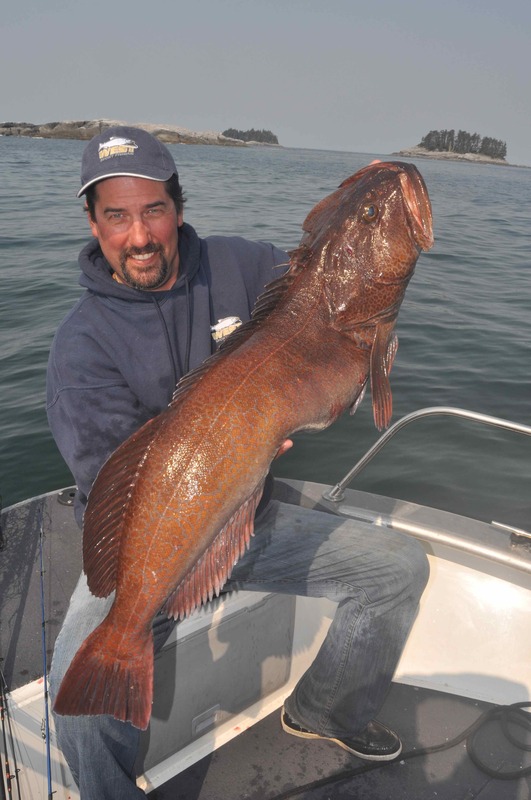 We got lingcod to almost 40lb, and a veritable smorgasbord of colourful rock fish including stunning yellow eye rock fish to 11lb. By the end of the trip I had added 15 new species to my personal tally. The staggering beauty of coastal BC really has to be experienced to be fully appreciated, truly this is a very special part of our planet. 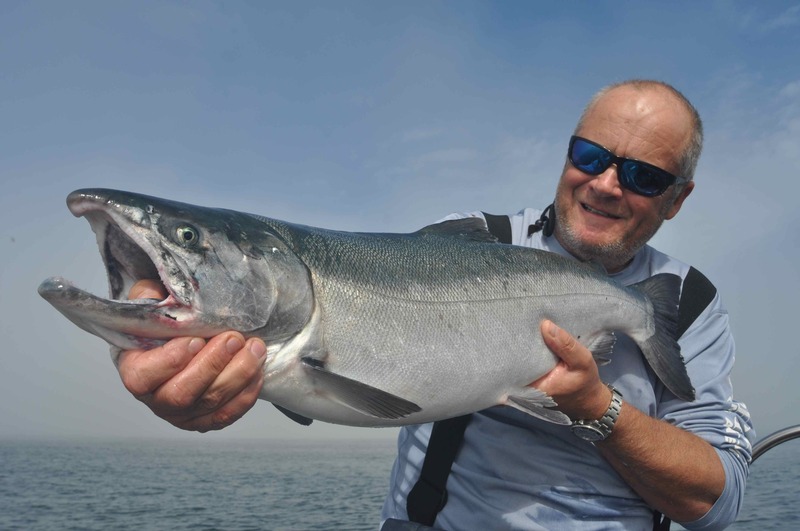 Aside from world class fishing the areas flora and fauna is both rich and varied. During our stay we watched numerous sea otters in classic repose, lying on their backs as they contentedly munched away at a sea urchin. Daily we saw whales, both killer whales and enormous humpbacks, often within casting range of the boat. There are bears and wolves here, too, and the birdlife is equally spectacular with numerous bald headed eagles that sit on the highest outcrops of rock, patiently waiting for their chance to swoop on any hapless rock fish floating on the surface; they know an easy meal when they see one! Yes its a great place, put it on your list! Thanks James, its an amazing place! 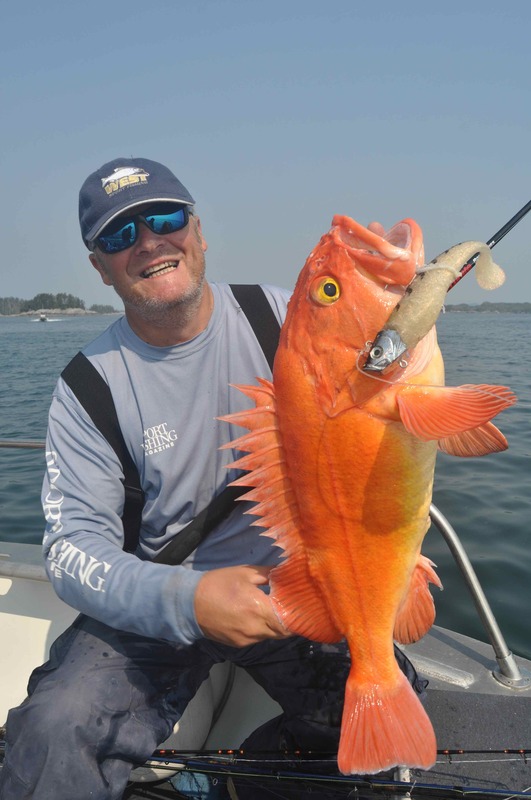 Are you aware of the natural history of the yelloweyes and other demersal rockfish? We lived in Alaska for many years and fished for them very occasionally. The ones you are holding are likely over 100 years old. They spawn at an age between 85-125. Like mining when fishing for them. Once removed from the environment, it takes a long time to replace them. In Alaska and we presume BC, you must carry a device to deep release them. This does not apply to the pelagic species. Have you fished the Malvinas? We’re thinking of a trip this winter. Let us know if you would like to be on our update list. 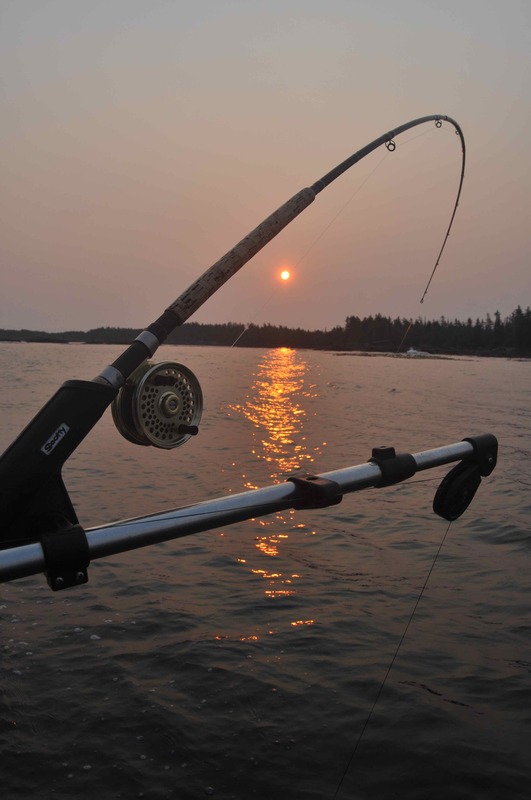 We periodically write about all of our subsistence activities including fishing. Some interesting facts, thanks. We caught a lot of different species of rock fish during the trip, only one was harvested, the 11lb yellow-eye in the picture. 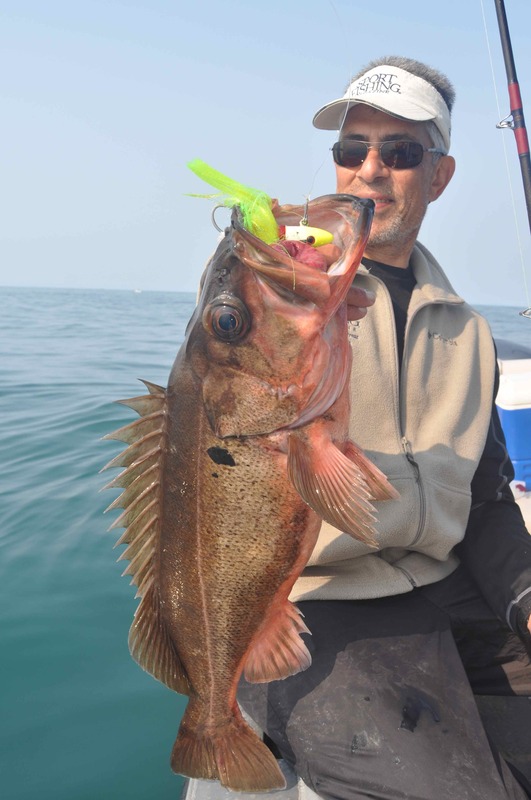 All others were released and as we were fishing light tackle in very shallow water, typically 40-60ft, the overwhelming majority swam back strongly. Obviously if fishing deeper water cases of barotrauma would have affected more fish. Carrying a venting tool would then be a great idea. No, never fished Malvinas, let me know how you get on! That’s really interesting. We never caught a yellow-eye in less than 50 fathoms. Most were in 100+ fathoms. We see no problem in 50-60 ft. Looking forward to your future posts. We had a great afternoon of fishing on Friday.